Moderation in everything. it’s the sort of thing your gran might say. (probably not the sort of thing our gran might say. not when she gave birth to 18 children). and she would be right, particularly where the sun is concerned. great for you in small doses- lots of vitamin D in them there rays. very bad for you in large doses. this instant matte tan is the ideal antidote. the colour of hours of sunbathing, minus the age and other inducing side effects. your much-wiser-than-you gran would approve. 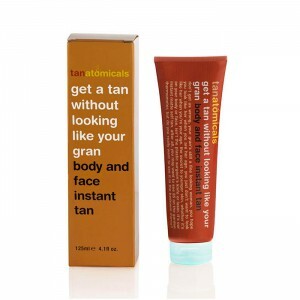 Tanatomicals Body Face instant tan 125ml – Don’t get us wrong, your gran’s still a fine looking woman. You hope you look like her when you are her age. You just don’t want to look like her when you’re your age. The secret to younger skin, whether it’s on your body or face, isn’t the plastic surgeons knife or laser, it’s our instant matte self tan. After all, you may want to see 85 on the garden thermometer, but do you really want to see it in the bathroom mirror? – We only want you for your body. Anatomicals Tanatomicals Get A Tan Without Looking Like Your Gran is an instant for the face and body. This instant tan can create a flawless and instant matte tan that easily washes off.